AIP Energy Services Agreement – American Independent Power, LLC. AIP has developed a unique approach when it comes to capital exposure and securing the capital needed to place the equipment needed to reduce the Host site energy costs with a predetermined cost and energy output. We can take this approach because of our ability to provided predictable energy output 24/7 based the LN2G Power Plant System design and configuration at a certain capital cost. By utilizing equipment financing already structured by AIP with a preferred Lender, the Host guarantees the financing at a minimal risk by exchanging the ESA payments for power that lowers their overall energy cost for the term of ESA. The repayment of the financing is absorbed within the monthly ESA payments already agreed to by the Host so there is no additional cost to the Host beyond the ESA payment. One full-year of electrical bills that cover all the seasons (needed to estimate savings). Description size, type of operation & equipment. Notifications from Utility of pending increase. Do you have a contract for reduced rates? Expansion plans with anticipated power needs. Pending orders that may increase demand. Space availability or limitations at site. State or local regulation on renewables. Site survey for placement possibilities. AIP will determine the amount of power needed to support your operation and also provide savings. AIP will do a basic analysis on your blended electric rate to determine the potential savings. If potential savings warrants next steps, a proposal will be prepared for your review. 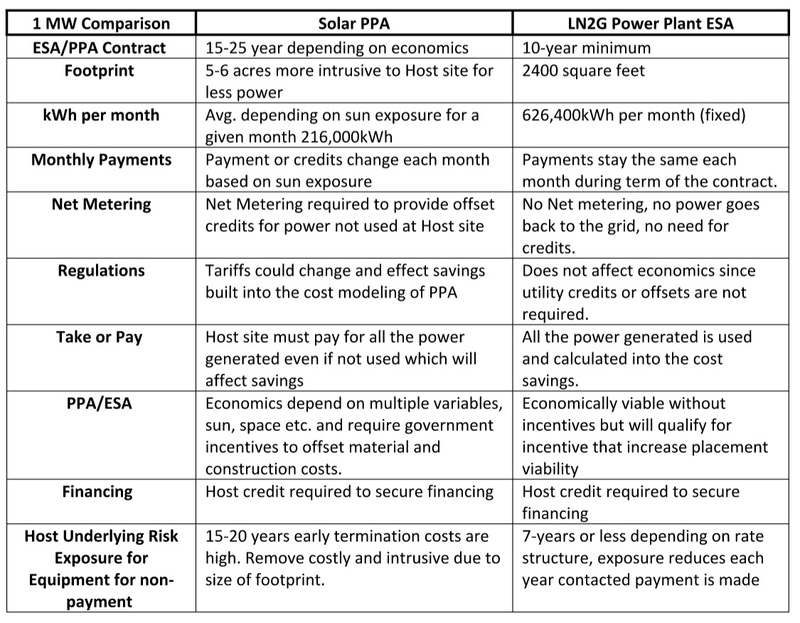 With your acceptance of the proposal, an Energy Services Agreement (ESA) term sheet will be prepared for signature. With the ESA term sheet signed, the credit approval process will be initiated directly with our finance company. The approval process will take 7-10 days. A site review will determine any placement restrictions or needs that might increase installation costs. With finance approval, all stipulations and conditions are incorporated into a final ESA term sheet, and signed off by all parties. A full ESA is drafted and prepared for signature. With the fully executed ESA and after funding, site preparation will be initiated. LN2G component are assembled at facility for testing. The complete LN2G Plant is ETL certified for performance and power output verification. Your company representatives are invited to review LN2G operation and power output for sign-off prior to shipping.